Indigenous people who live on the Chukchi Peninsula in the Russian Far East and in Western Alaska have experienced a dramatic shift in their sea ice use and knowledge over the past two generations. Several indigenous languages traditionally spoken in the region are on the decline, and in many communities far fewer people are venturing on the ice during the winter. 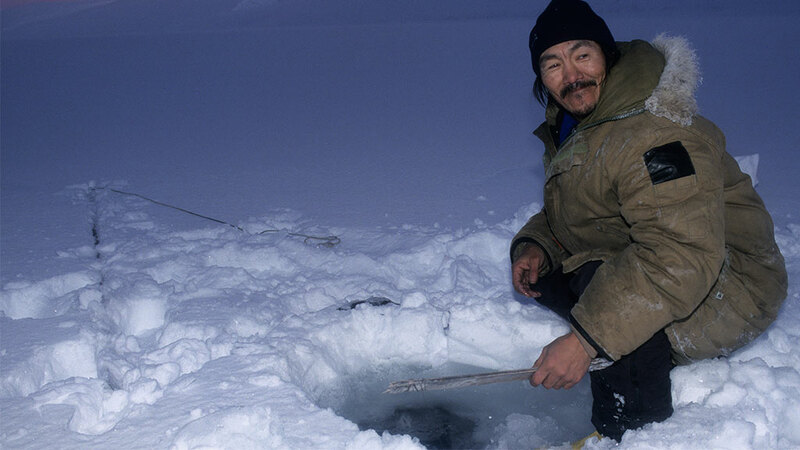 As these processes continue, an impressive amount of traditional expertise about Arctic ice and the skills needed to master the ice-covered environment may not be passed to the next generations of indigenous hunters. Also, without proper documentation, it will be lost for scientists and the general public, making our common drive to understand the mechanisms and the impacts of the Arctic climate change more difficult. Dr. Igor Krupnik of the Arctic Studies Center at the Smithsonian Institution is a renowned anthropologist who has conducted research in indigenous communities in Russia and Alaska for several decades. He offers some insight into what has been uncovered in the recent studies in this region under the Sea Ice Knowledge and Use (SIKU) project. What are you trying to accomplish in the SIKU project? Record indigenous knowledge before it disappears? Our SIKU project is much more than just recording the "disappearing" indigenous knowledge. In fact, it is not disappearing in a conventional sense, like people tend to view the future of "endangered languages." The main purpose of the SIKU project is to build a legacy of indigenous people's participation in the IPY 2007-2008. We had already been recording indigenous knowledge for many years before the latest IPY; but the IPY really gave a major boost to this process. In Alaska and Siberia where I am working, we want to expand and to solidify indigenous people's role in climate change research by inviting them to become ice and weather observers in their native communities. Their records will eventually become part of the overall IPY database and thus will give us more diverse sources to analyze Arctic climate change than just records from instrumental observations or professional scientists. We always ask people to document on a daily basis what kind of activities are taking place on the ice as well as how much and how often. For example, I communicate regularly with observers such as Leonard Apangalook in Gambell on St. Lawrence Island, or Clara Mae Sagoonik, who lives in the village of Shaktoolik in Western Alaska. Overall, we have SIKU observers in eight communities in Alaska and Chukotka. Their data will be put into a database and will become a part of the IPY legacy. Data and observational records from indigenous people make an entirely new component of this IPY; they were not collected or even sought during the previous IPYs. Why has the SIKU project been three years long? In order to understand how people are using the ice you have to get some statistics on how often people go out on the ice over several winters. This is our third year of SIKU project observations, and for many communities we have three consecutive winters of daily records of not only local ice and weather conditions but also how these conditions affect what people are doing on a daily basis, like how many people go on the ice, what are they doing on the ice or why they don't go on the ice on a given day. Going through the observational records - at least from the places I am connected to in Alaska and Siberia - it is clear that people are not using the ice like they used to a generation or two ago. In many places people do not use the ice regularly until late winter or even spring when they start ice-fishing, crabbing, seal hunting and preparing ice trails for spring whaling camps. For a few months from November until January or February in many communities, people hardly ever go on the ice anymore. Traditionally what would indigenous peoples in Alaska and Siberia do during these months? They would hunt seals, occasionally walruses, and go ice fishing throughout the late fall and early winter. But they are not doing this any more. What will the data you collect during SIKU eventually be used for? For indigenous communities finding out ways to deal with climate change, or for scientists who may be looking to conduct a study using the data as a baseline to work from? The data will be used for both of these purposes and for several others as well. But the main idea is to take a snapshot of the knowledge and use of the sea ice environment across a large portion of the Arctic, from the Bering Strait to Greenland between 2006 and 2009. It is a very strong incentive to many of our local partners that 50 years from now their grandchildren will look back at their observational records to learn about past climate and ice conditions and also about what people used to do on the ice. Today's observational journals will be an invaluable source of information in assessing how things will develop over the next 50 years. The data we collect for the SIKU project - in particular the sea ice dictionaries, which contain local sea ice terminologies and information about the use of ice in terms of safety, navigation and orientation - are being returned to the communities as posters and CDs and published in books for the community to use in local heritage and educational programmes, for example. One thing we have done on this front is compile with Winton Weyapuk and several other partners a 110-page illustrated colour book called Wales Inupiaq Sea Ice Dictionary for the community of Wales in Alaska. Is there also a sense of urgency to record this knowledge now before more changes take place in the Arctic and traditional practices die out? Yes. You could say that we are documenting "endangered knowledge about shrinking ice." In some places we do not know which is going to last longer: the sea ice in its present condition or the knowledge about the sea ice that in many places is becoming endangered because of the economic changes or language transition to Russian, English, French or Danish. Another reason is that - at least in the parts of Alaska and Siberia I am studying - people have stopped travelling on ice the way they used to, even compared to a generation ago. This is due not only to changes in the ice conditions, but also to changes in the economy. In many places people have stopped using dog sleds and have switched to snowmobiles instead. This entails huge fuel and maintenance costs, so this causes people to venture on the ice less than in the old days. What did people used to do on the ice a generation or two ago? Traditionally, indigenous people in Siberia and Alaska used to hunt on the ice in winter either on foot or on dog sled. They would also pull boats over the ice. People were reluctant to travel outside their communities much, particularly during the wintertime. Usually, there were particular times during the winter when people travelled to nearby villages for special events, like festivals and community meetings. Now with snowmobiles people can run over the ice to visit nearby communities, to go hunting or simply to take recreational trips. They tend to travel more in winter, although this is, perhaps, more the case in Canada and less so in Alaska and Siberia. The ice is very different in Canada. There, you have more flat, land-fast ice in frozen bays and straits that is easy to ride over, whereas in Alaska and Siberia the ice is more rugged. So when people travel by snowmobile in winter they mostly travel over land or river ice. In many local communities they also take small planes for travelling, even to nearby villages. However it is important to remember that one does not need the same level of detailed knowledge and the same focus of that knowledge when driving a snowmobile at 30 or 40 km/h with GPS navigation over land-fast ice versus when one is hunting on foot or on dogsled at the ice edge or on the moving ice floes. It is very different in terms of navigation and safety, in terms of preserving traditional orientation skills and in terms of knowing traditional place names. You just travel too fast to keep all this information in mind. In many places the elder hunters have complained that because of the new speed of transportation, the level of traditional navigational and weather forecasting skills, the knowledge of local place names and traditional stories associated with them is decreasing among younger hunters. You mentioned a certain loss of knowledge due to the increased use of new technology. But has there also been a loss due to the diminishing frequency of transmission of indigenous languages to the younger generation? It varies from place to place. It is a far more serious factor in Siberia, northern Alaska and the western Canadian Arctic where most of the active adult population now speaks English or Russian. It is not that much of a problem in the eastern Canadian Arctic and certainly not in Greenland, where local Inuit people still use the language of their ancestors for daily communication (Inuktitut in Canada and Kalaallisut in Greenland). Normally, there are two lines of transmission of indigenous knowledge: one via indigenous language and the other one via active practical use of that knowledge through hunting, travelling, navigating, and observing the environment. That latter channel is also changing rapidly; it is changing not only because of the changing ice and new technology, but also because of the changes in how today's people are using the ice. In years past, people across the Arctic used to hunt every day because their families had to eat every day. If you ask the Elders about the 1940s and 50s - to say nothing about earlier decades - they will tell you that people used to go out on the ice every day. Now, if it is snowing or they have a community meeting or they work five days a week, the younger generation can purchase food at the store. They do not have to go hunting every day. This is an option that was not available to their grandfathers. Igor Krupnik is Curator of the Arctic Studies Center at the Smithsonian National Museum of Natural History in Washington, DC. He was a member of the Joint Committee for the International Polar Year 2007-2008 and the U.S. National IPY Committee. He has worked to raise awareness about socio-cultural issues, ecological knowledge, and environmental observations of northern residents.